Thousands of immigration activists and supporters descended onto Federal Plaza late Tuesday afternoon to denounce the Trump administration’s decision to eliminate the Deferred Action for Childhood Arrivals program. “I am here to show solidarity to my fellow peers,” said Andrea Solis, who attended the rally. “We need to focus more on education than deportations.” DACA was introduced by President Obama in 2012 as an enforcement policy that temporarily deferred deportations for hundreds of thousands of young people who were brought to the United States as children. 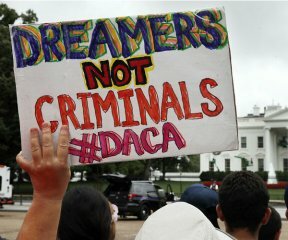 While never intended to be a permanent solution, DACA brought stability to the lives of so many, providing nearly 800,000 young people to date with the opportunity to live, work, drive, and participate openly in society without fear of apprehension and deportation from the only country they call home, including 42,000 in Illinois. Attorney General Jeff Sessions announced its termination on Tuesday. Angelica Magana, who is undocumented, took the microphone at the plaza rally to call on Illinois Congress members to draft replacement legislation to protect current DACA recipients. “When DACA passed, it gave me an iota of hope. Now that has been taken away. We will not live in the shadows anymore,” Magana said to raucous applause. In Illinois, Dreamers can become bar-certified attorneys but lack access to licenses and certifications in other fields such as health care, education, social work, and real estate. Governor Rauner and the Illinois General Assembly should change the law to allow Dreamers to enter additional professions and remain in those professions even after DACA expires. Governor Rauner recently signed the Illinois Trust Act into law and established important protections for undocumented residents. The law prohibits local governments from detaining undocumented residents on behalf of ICE. At the same time, the Trust Act allows home rule municipalities to opt out of the law and permits governments to communicate with ICE about detained individuals prior to their release. Governor Rauner and the General Assembly should strengthen the Trust Act to prohibit any cooperation or communication with ICE when it comes to Dreamers and disallow any local governments from exempting themselves from these new Dreamer protections.